Disability Fund Reaches Zero in 2016. Will Beneficiary Payments be Stopped or Reduced? Second Blog Post about the Disability Fund. The Disability Fund holds a surplus that can be used if the annual payroll tax receipts for disability are less than the payments required to disabled beneficiaries. Every week 6.2% of your salary is deducted from your paycheck, and sent to Social Security. At the same time an amount equal to 6.2% of your salary is also paid by your employer to Social Security. Social Security receives an amount equal to 12.4% of your salary each week for you, one half paid by you and one half paid by your boss. These amounts are paid by you and your employer as taxes, but since the program is social insurance, and it is for your benefit it is useful (but not legally binding) to think of it as funds held for you and invested for you. Social Security collects the tax and uses the receipts for retirement beneficiaries and disabled beneficiaries. If your salary in 2013 is $50,000, then $3100 of that is sent to Social Security in your name, and your employer sends Social Security another $3100 in your name, for a total of $6200. Altogether in 2013 workers and employers paid to Social Security 721 Billion in payroll taxes. In addition Social Security received (was credited with) 24 Billion income taxes paid on Social Security benefits, and 106 Billion in annual interest credited to Social Security by the US Treasury for the retirement and disability reserves held for Social Security by the US Treasury. Total Receipts to Social Security in 2013 was 851 Billion. The amounts held by the US Treasury in the Social Security Fund are only the surplus of the receipts over the expenses from this year and prior years. The funds that you and your employer paid in during 2013 in your name were paid out in the same year to the disabled and aged citizens who are receiving benefits in 2013. When you are older (or become disabled) you will receive from Social Security as benefits the funds that will be paid by workers and their bosses as payroll taxes in the year you receive the benefits. So if you retire in 10 years, in 2025, the payroll taxes paid in 2025 by workers and bosses will be received by Social Security that year and then paid out to you as benefits in 2025. The Social Security Trust Fund holds a surplus if there is a surplus, meaning if there has been a period when the Social Security payroll tax receipts were greater than the benefits being paid. During those periods, the Trust Fund builds up and stands ready to help pay benefits even when the payroll tax receipts are less than the disability and retirement benefits being paid out. The Social Security Trust Fund allocates receipts into two segments, the Disability Fund for Disability Insurance (DI Fund) and the Old Age and Survivors Insurance Fund (OASI Fund) for retirement. According to a pre-set formula, the payroll tax receipts are placed in either the Disability Fund or the Old Age Fund. For instance, of the 851 Billion of total receipts to Social Security in 2013, 743 Billion was placed in the old age fund, and 111 Billion was placed in the Disability Fund. Since 2008, the Disability benefits paid out each year have been greater than the amount of receipts designated for the Disability Fund. After all the Disability Fund receipts from that year are paid out, any additional amounts owed are paid from any surplus in the Disability Fund. In 2013 the Disability program paid out 143 Billion in benefits. Since the Disability Fund receipts that year were 111 Billion, there was a shortfall of 32 Billion, which was paid from the Disability Fund. 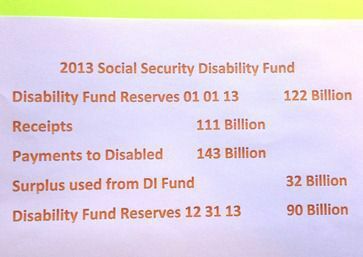 However by the end of 2013, after taking out the 32 Billion the Disability Fund had only 90 Billion left. If the Disability Fund was to continue along with similar receipts and beneficiary expenses during 2014 and 2015, one can see how exhaustion of the Disability Fund surplus would occur, since the surplus balance is 90 Billion at the start of 2014, and the annual loss is about 32 Billion. Each year that the disability beneficiary payments exceed receipts by 32 Billion, the Disability surplus would be tapped for that amount so that payments to beneficiaries can remain at 100%. Since the Disability Fund only holds 90 Billion of surplus at the start of 2014, the fund could only be useful for making up a shortfall for approximately another 33 or 34 months after January 1 2014. Thus we get the predictions of the Disability Fund reaching zero in late 2016. How can this be fixed so that beneficiary payments can remain at 100%? Congress can re-allocate some of the retirement surplus to the Disability Fund, or Congress can enact structural reform. More about that in the next blog post. Applying or appealing for SSDI benefits can be confusing and discouraging. If you live in Massachusetts, New Hampshire or Rhode Island, a Keefe Disability Law attorney may help you. Learn about this by calling our firm at 888-904-6847.